Fortune tangerines are medium-sized and more rounded than other mandarin varieties with only a slight flattening at each end. They measure an average of 5.5 centimeters across and 5 centimeters tall. The thin, orange rind has a smooth surface and peels easily despite adhering tightly to the flesh. Fortune tangerines are seedless, though if planted with other cultivars they can become seedy. The flesh is very juicy and offers a slightly sweet flavor with a lingering tartness. Fruits harvested later in the season may be sweeter and less acidic. Fortune tangerines are available in the spring months. Fortune tangerines are a variety of mandarin, botanically classified as Citrus reticulata. They are the result of an intentional cross between a clementine and an Orlando tangelo. Fortune mandarins are more widely consumed in Europe than they are in the United States, though they are available through small farms and at farmer’s markets. 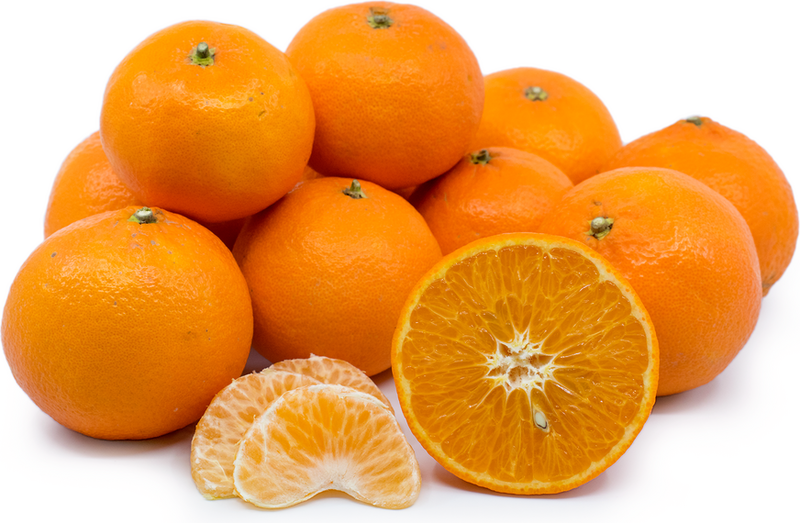 Fortune tangerines are an excellent source of vitamins A and C, as well as dietary fiber and folate. They provide minerals like calcium, magnesium, and phosphorus and the electrolyte potassium. The vitamin C, along with beta-carotene, lutein and zeaxanthin, make Fortune tangerines a good source of antioxidants. Fortune tangerines can be eaten raw, juiced, or used in cooked applications. Add peeled segments to fruit or green salads, in salsas and relishes. The tartness of the fruit is well-suited for blending with other juices in beverages or smoothies. The juice can be used in marinades for meats or fish or used in sauces or syrups. Use Fortune tangerines in baked goods, frozen desserts, jams or jellies. Store Fortune tangerines at room temperature for a couple of days, refrigerate for up to 2 weeks. Fortune tangerines were at one time the second most widely cultivated mandarin in Spain, after the clementine. Unfortunately, the trees are highly susceptible to Alternaria brown spot. Because of this, Fortune tangerines are being replaced by other varieties, most of which are triple-cross hybrids, developed using Fortune tangerines as a parent variety. Spain has created over 13 different varieties using Fortune tangerines. Fortune tangerines were developed by the United States Department of Agriculture’s Date and Citrus Station in Indio, California. They were introduced in California in 1964 and were later introduced to Spain in 1974. They became popular in Spain, the largest exporter of citrus to Europe, and are grown along the French Riveria on the Mediterranean. In Spain, Fortune tangerines are used as the parent variety for other intentional crosses. They have also been used as the parent citrus for several varieties in New Zealand. Fortune tangerines can be spotted in Spain and France, and to a limited extent in Southern California.